Rome is a city of traditions, a city of the past, where rituals stay alive century after century. Among the odd ones in my view is the celebration held every year on the 16th of March at Palazzo Massimo alle Colonne, near Piazza Navona. There, the palace exceptionally opens its door to the public on that very day for a mass in commemoration of one of its members, Paolo Massimo. On the 16th of March 1583, a miracle happened in the palace. The young Paolo, who was only 14 at the time, was dying after two months of agony. The family called in their close friend, St Filippo Neri, founder of the congregation of the Oratory, who was based in his nearby church on today’s Corso Vittorio Emanuele. When he arrived at the Palace, the young boy was already declared dead. Neri embraced him, and the boy briefly regained consciousness just to say that he wasn’t scared of death, but instead was very serene to join his mother and sister, who had both died a few months previously, in heaven. Shortly after he died. His bedroom was then turned into a little chapel where the commemoration has been held since. St Filippo Neri died two years later at the age of 79. He was beatified in 1615 by Pope Paul V and canonized by gregory XV in 1622. I wasn’t expecting to attend such a ceremony when I went on that day. While I was standing in the relatively crowded Baroque chapel watching people coming in and out, I felt people were waiting for something to happen. After nearly an hour, people moved to open the way towards the altar and a cardinal wearing a shiny red robe and red cap, ceremoniously walked in. He performed a ritual and then mass. I read afterwards that it was part of the tradition that a cardinal would always give that special mass, and that Pope Benedict XVI himself had given it when he was a cardinal in Rome. That was the closest I had come to the old Roman aristocracy, which has always had strong links with the church. I wasn’t sure where I was on that day, it did feel a little unreal, like being part of a Fellini movie. The Palace, which is still privately owned, was designed by Renaissance architect, Baldassare Peruzzi, to replace the previous palace destroyed during the 1527 sack of Rome. 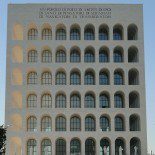 It is very distinctive for its curvilinear facade which follows the lines of the antique circus of Domitian previously standing there, and on which today’s Piazza Navona was built. This entry was posted on March 16, 2011 by Salambo in Arts and culture, churches, Daily life in Rome, English, palaces and tagged 16th march, filippo neri, oratorio dei filippini, oratory, palazzo massimo, Roma, Rome, traditions.